A Wabash College student director will be undertaking a grand project this summer in Bolivia. 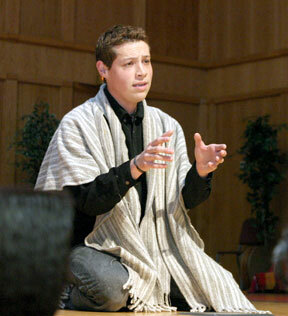 Reynaldo Pacheco ’06 will be directing the Philharmonic of Lapaz’s youth group version of the musical Chicago. "I started directing here in the U.S. a little while ago, at the (Crawfordsville) Vanity Theater," Pacheco said. "And then I sent in my resume to be an assistant director for Chicago and then just a month ago, they sent me a letter back saying that I would be directing the musical." Pacheco began doing theater with the Philharmonic of Lapaz four years ago after he was approached by Ricardo Estrada, the group’s maestro. He was asked to audition for Jesus Christ Superstar as a chorus member, but he wanted to be an understudy for one of the more important roles. He was told he had no chance getting one of the positions but he tried out anyway and was given the understudy role of Pilate. He has been acting with the Philharmonic ever since. He has done Cats, Les Miserables, Joseph and the Amazing Technicolor Dreamcoat and Oliver. Pacheco has been asking to assist other directors. He has been given the chance to help direct Grease and The Wizard of Oz with the youth group of the Philharmonic. Although he has helped direct before, he has never directed a show this big as the main director. He’ll head to Bolivia to direct the show after participating in the Wabash College Ecuador program. "This is really exciting for me," Pacheco said. "This is one of the biggest things in Bolivia. I’m just going to be down there directing right after I’m done in Ecuador. It’s going to be me, a musical director and a choreographer." Pacheco’s love and fascination for theater comes from his love of film and photography. "Film is just a lot of moving photographs," Pacheco said. "Plus, without theater there is no film." Pacheco does photography with Andrew Dits ’07 and has a photo exhibit to soon be presented at Wabash. His photography is what got him interested in film along with his interest in theater. "I came to Wabash and found Michael Abbott, who helped me with some filming," Pacheco said. "He gave me a few tapes and then I made some films of my own." Although Pacheco seems like a complete student of film and theater, his real focus at Wabash is language. "I came to Wabash with getting a language as my top priority," Pacheco said. "I wanted to go to a liberal arts college so that I could continue with Spanish and learn English as well as pick up another language." Pacheco has succeeded in mastering English as well as learning French. He spent a semester in Paris taking nothing but film classes. Reynaldo Pacheco has become exactly what he wanted: a theater major who directs plays with a major theater company, a film maker and a master of three languages. That’s using your liberal arts education. Barre is a freshman writer for Wabash College's student newspaper, The Bachelor.